This 7 days gorilla trekking tour starts and ends in Kigali . 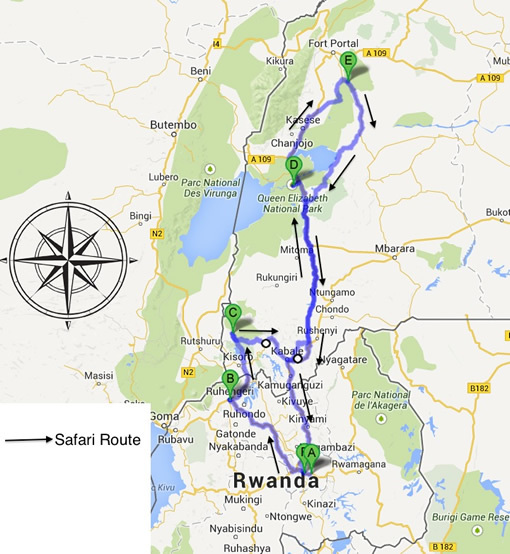 This tour can as well end in Kampala with double gorilla tracking one in Rwanda and the other trek in Uganda. After breakfast, your tour guide will transfer you to the park headquarters for briefing by the park warden. At 8:30 am local time, the gorilla trek begins. It normally takes between 2 to 8 hours depending on the movements of the gorillas in the jungle the previous night.overnight at Bakiga Lodge (mid-range), Gorilla Mist Camp/Gorilla Safari Lodge/Chameleon Hill Lodge(luxury). After an early morning breakfast transfer to Kibale Forest national park for an afternoon chimpanzee tracking. Overnight stay at Crater Safari Lodge(luxury),Primates lodge(mid-range), Chimpanzee Forest Camp(budget). 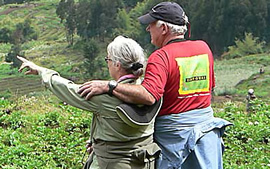 A 5 days Gorilla trekking in Volcanoes National Park,the home of mountain gorillas in Rwanda. This is the best trip for primates enthusiasts! The 6 Days Uganda Gorilla safari takes you to Bwindi national park, Kibale national park for chimps trekking & Murchison falls national park for an amaizing view of the water falls. Gorilla Trek Africa makes sure all our clients stay at the most relaxed during a safari with us,in clean and highly rated safari establishment in the different destinations Uganda, Rwanda, Kenya, Tanzania, Burundi and DR Congo. Our preferred high end hotels in Kigali are Serena Kigali Hotel, Gorillas Golf Hotel and Mille Collines Hotel, In the mid-range category we have The Garr hotel and Lemigo Hotel. Hotel gorillas is a Five star hotel situated within Kigali city. The charming establishment comprises of 31 fully furnished rooms, a cozy bar & restaurant and a swimming pool. Beautiful hotel for all types of travellers offering visitors high quality comfort and very clean Rwanda hospitality. Centrally situated in Kigali city, just 3 minuted drive from the Kigali international airport and hence a very convinient accommodation in Kigali. Le Bambou Gorilla lodge is located in Rwanda’s Northern province, in Volcanoes National park – comprising of 9 comfortable self contained Bandas and a one family cottage. 3 Star hotel situated 10 km from Volcanoe NP with 48 fully furnished rooms & 4 elegant suites with an intimate atmosphere to make clients comfortable. Located in Musanze district. Nyungwe Forest has limited range of accommodations. Our preferred luxury lodge is the magnificent and award winning Nyungwe Forest Lodge. In the mid-range we have Nyungwe Top View Lodge. At Lake Kivu, our high end choice of lodge is Lake Kivu Serena Lodge. In the mid-range section is Paladise Malahide, Hotel Gorillas Lake Kivu and Palm Beach Hotel, among others. Paradise Malahide is a charming and friendly guesthouse with 10 rooms – and 4 apartments. It’s well run, and with great food and a lovely location we think it’s excellent value for money. In Akagera national park, we use Ruzizi tented camp for high end and Akagera game lodge for budget.